King Cashalot is a popular medieval-themed progressive online video slot released by Microgaming. The slot features multipliers, bonus games, and a progressive jackpot. King Cashalot comes with nine paylines and players have to place a fixed bet of $0.05 per active payline. If players activate all paylines, they will have to place a bet of $0.40. Players should remember that they can qualify for the progressive jackpot of King Cashalot only by betting maximum. Once players place their bets, they should hit the Spin button. If a winning combination of symbols is displayed on the screen at the end of one spin of the reels, they will win payouts. Otherwise, they can bet and try again. Players can play the game in the regular mode or the expert mode, which is packed with advanced features such as Autoplay, Spin 10x, and Spin 5x. King Cashalot takes players to the Medieval Age, where they can meet medieval kings, beautiful damsels, and fairy creatures. 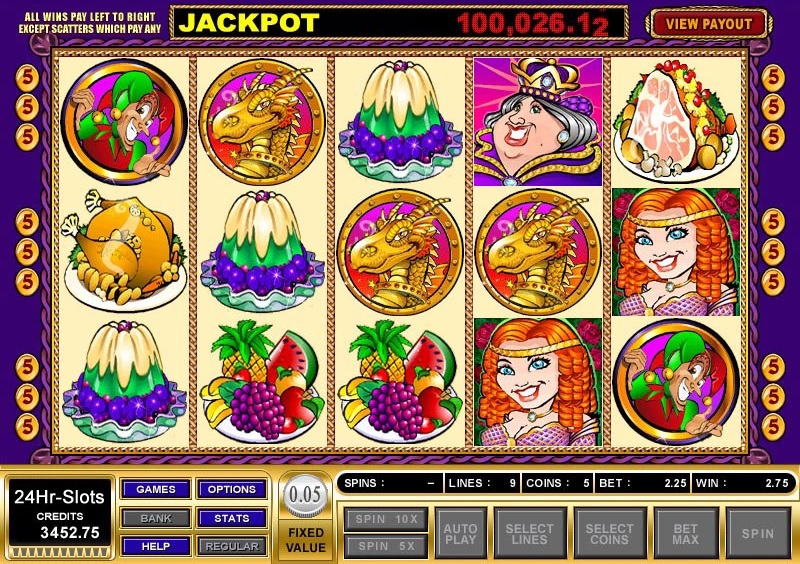 The slot features beautiful graphics, splendid animations, and exciting audio effects. If players want to be part of the adventures of a medieval knight and win exciting prizes, they must spin the reels of King Cashalot. The reels feature icons of a plump queen, a knight, a beautiful damsel, turkey, fish, pudding, and fruits. The most exciting feature of King Cashalot is its progressive jackpot, which players can win only if they bet max. The progressive jackpot goes to the lucky player who successfully lines up five King Cashalot symbols on the ninth payline. The King Cashalot symbol not only helps players win the progressive jackpot, but also serves as the wild multiplier. If players take King Cashalot’s help in spinning a winning combination, their payout for that combination gets doubled. However, the progressive jackpot and the top fixed jackpot do not get doubled. If players spin a combination of five King Cashalot icons on any active payline, except the ninth, they will win the top fixed jackpot of 15,000 coins. King Cashalot has two scatter symbols—the Jester and the Dragon. If players land 2, 3, 4, and 5 Jester symbols anywhere on the reels, they will win x1, x2, x5, and x50 their bet amounts, respectively. When players land Dragon scatter symbols anywhere on the second, third, and fourth reels, the Treasure Bonus Feature gets activated. When this happens, eight Treasure Chests appear on the screen. Players have to select one of these chests to win a bonus prize. If they do not like this bonus prize, they can reject it and try again up to three times. Although one of the older slots in the Microgaming portfolio, King Cashalot still enjoys a great deal of popularity and is definitely worth playing.